Safedome puts your customers’ brand on smartphones, wallets and keys - the holy trinity of today’s branding real estate. Safedome, the tech innovation company responsible for creating the world’s first and thinnest Bluetooth tracker card, is now launching the world’s first wireless charging Bluetooth 5 tracker card, as part of a three-tiered branding solution. “When dealing with marketing companies and large commercial corporations in the insurance, airline, automotive and banking industries, we kept seeing the same opportunity,” explains Matt Denton, CEO of Maxwell Forest, the company behind Safedome. “And customisation nowadays means more than just a company’s logo on a standard gift item,” adds Matt Denton. People are living in a technological and aspirational era, where everyone takes pride in their home, car, acquisition of the latest smartphone or smartwatch. When buying promotional products, many companies are looking for items that are memorable, products that create a positive perception in their customer’s minds, and are more environmental than disposable gifts. Safedome is a Bluetooth tracking card made to fit in a standard wallet. The card connects to your smartphone via Bluetooth 5, with alerts received on your phone when Safedome moves out of range. Safedome can also find your misplaced phone, even if it is on silent. What really sets Safedome apart from its competitors is that it can be wirelessly charged. The short battery life of many promotional Bluetooth trackers means they’re thrown away every 12 months or so – not very cost-effective as a branded promotional gift. Safedome’s world-first wireless charging avoids these issues, allowing a company’s promotional product to remain with their customer for at least 4-5 years. “Wired chargers can easily get lost in cable clutter and are rapidly disappearing. What better place to charge your Safedome card than the same pad that you use for your Apple iPhone 8 and iPhone X, Samsung or your new smartwatch,” says Matt Denton. Safedome products can be tailored to meet a company’s specific promotional needs, whether that’s a branded tracker fob for digital car keys, or a card for a wallet or passport holder. Safedome tracking technology can even be integrated into a Mastercard credit/debit card or a company’s customer loyalty card. Safedome offers a range of customisable Bluetooth tracking products. The technology can be built into a slim card, fob or a credit card (0.76mm thick). 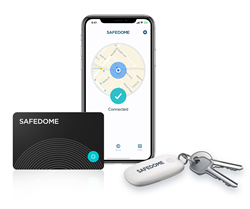 Safedome products connect to an app on your phone and sends alerts if you and your valuables are separated, helping safeguard your wallet, passport, tablet/laptop, car keys, luggage and much more. This customisable technology can help organisations engage more meaningfully with their customers and position their brand at the centre of their lives.